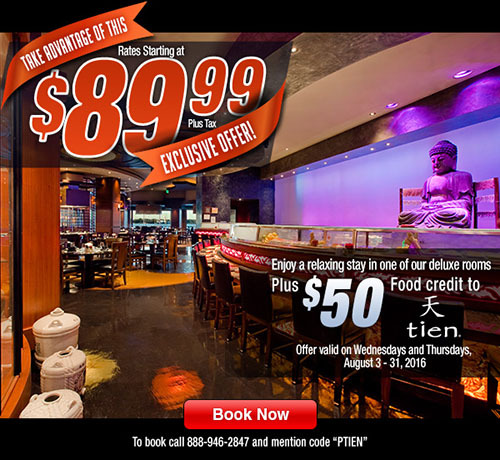 The Imperial Palace at the IP Biloxi is having a great room special for the month of August, which includes a $50 voucher for lunch or dinner at Tien, the IP’s magnificent Asian-Style Buffet! This deal is only good for booking on Wednesday or Thursday, but it’s still a great deal if you can get there later on Wednesday night, take off Thursday, then enjoy another exciting night of gambling and entertainment. Then, you can be back at work on Friday. Don’t miss out!